Is there no end to people stealing the premise behind Groundhog day? I mean I'm not complaining, I do like Groundhog day, and people dying on screen, well that;s always good. 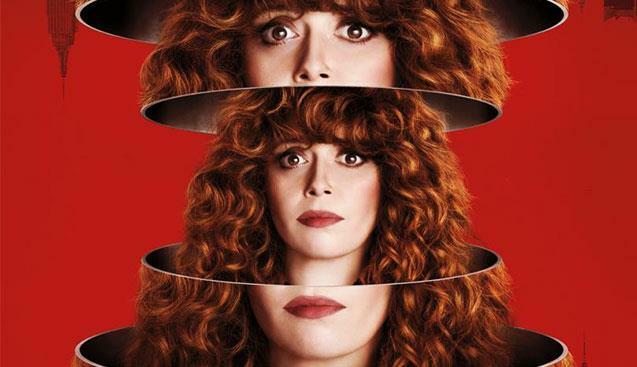 Russian Doll is a Limited Netflix series that has our main character dying over and over and reliving the same day. It all starts as Nadia (Natasha Lyonne) is leaving her 36th birthday party. She decides to go looking for her cat and is hit by a car and killed. When she wakes up she is right back at her party in the bathroom, where our movies started. So yes, the idea is absolutely the same as Groundhog day and Happy Death Day, and a score of other made for cable movies that use this very same idea. That doesn't mean the story still isn't interesting and doesn't have something to say. Because Russian Doll is a series and not a film, the audience has ample time to get to know Nadia. You like her character but realize she is closed off from the world and not willing to emotionally engage with much of anyone. She tries various solutions to her problem of dying over and over from seeking mental health to assessing the possibility that she is just on a bad drug trip, until she meets Alan (Charles Bennett) who also is stuck in the same death loop. Alan's girlfriend broke his heart by turning down his proposal and admitting she has been sleeping with someone else, causing Alan to commit suicide, The pair slowly realize they need each other to solve the mystery and the two develop a friendship. It's really the friendship between these two characters that is the heart of the story. The series doesn't try to make the pair lovers, that's not what this journey is about. Instead the focus is on the pair building a real friendship based off of caring for someone else, for no other reason than that person needs you. Natasha Lynne does a great job creating an emotionally starved person. Her character Nadia is best described as a female Andrew Dice Clay. She was funny, charismatic and really shined in the role. Lynne served as both the creator and producer for this series, so this was certainly a passion project for her. Russian Doll has it's slow moments and it can be pretty weird at times. However, give this series a chance, the ending is a very poignant discourse on how much we all need each other. I give the series 3.5 our of five stars. Russian Doll is currently streaming on Netflix.